Does anyone have a recipe for pecan delight candy? Delilah, I don't know what Pecan delights are but I do have a really easy way to make a good candy using pecans. You just take one of those small pretzel knots and put a Rolo candy on each. Pop it into the oven for about 4 minutes and immediately put a pecan on the top. They are delish! By the way, love your name. Butter the sides of a heavy 2 quart saucepan. Place the sugar, salt, corn syrup, milk, and butter in saucepan and set over medium heat. Cook, stirring constantly with a wooden spoon, until sugars have dissolved and mixture comes to a boil. Continue to cook to a soft ball stage, 236 degrees F on candy thermometer, stirring very often. Watch your heat. If it gets too hot, the candy could boil over. Remove from heat and allow candy to cool for 10 minutes in pan. Add the vanilla and nuts, and beat with a spoon by hand for approximately 2 minutes or until candy is slightly thick and begins to lose its gloss. Quickly drop heaping tablespoons onto waxed paper. If the candy becomes stiff, add a few drops of hot water. "The most fantastic, EASY candy you can make... sinfully delicious and habit forming. I have only seen this fail once, and then the disaster was the most marvelous gooey pecan praline ice cream topping. I melt candy caramels in a double boiler (Kraft Brand), add chopped pecans & mix in the double boiler. Drop by small spoonfuls onto a wax paper sheet sprayed with Pam.Then melt some almond bark or chocolate chips in the double boiler & dip each caramel/pecan ball in the chocolate & put it on the same wax paper to dry. If you don't have a double boiler you can use two sauce pans, one slightly larger than the other. 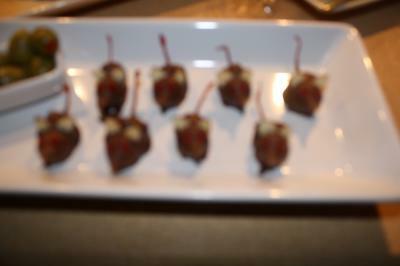 The picture is of some chocolate mice I made.